There's something about a nicely dressed table that just screams fall. It's a season that centers on comfort food so a pretty table cloth or stylish set of napkins seems like a must. But that doesn't mean you have to break the bank. We've rounded up four easy and inexpensive ways to add some fall flare to your linens. 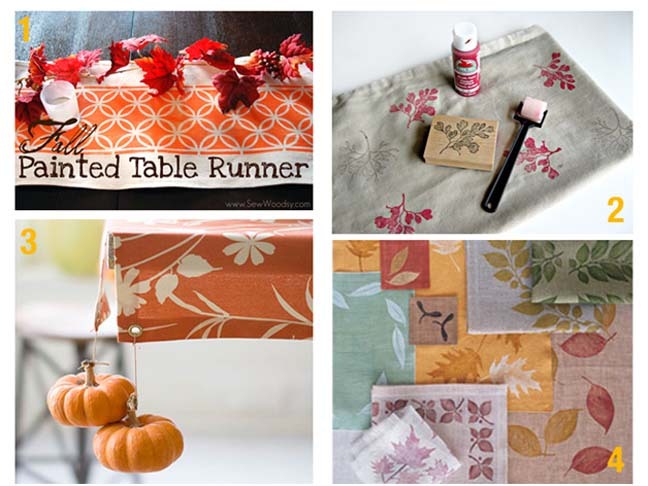 This fall table runner made with a drop cloth, a stencil, and some paint looks like something straight out of a West Elm showroom. Here rustic leaf stamps were used to spruce up some bed linens but the concept could easily be put to use in the dining room as well. Using mini pumpkins as tablecloth weights is a quick and easy trick that will add lots of impact to your table-scape. Of course a post on DIYing a beautiful Holiday table wouldn't be complete without Martha. Check out her Leaf Printed Linens post here.